Beautiful dalmation velboa fur you don't have to be Cruela Deville to love. Soft and beautiful at a price that beats the rest, makes a terrific main fabric or fabric trim. 58/60" width. Gentle machine wash.
My daughter is Cruella de Vil for her dance team solo, so its to add to her costume and her throne. I'm making a Cruella DeVil bomber jacket, and this material wasn't bulky. Plus, the price wasn't bad. my 4 month old granddaughter is going to be a Dalmatian for Halloween. Needed dalmation faux fur for my granddaughter's Halloween costume. I'm making a shawl for a costume and watched the Online Fabric Store video on YouTube and I like how easy the shawl was to make and how good it looked. Wanted it for a Chasing Vermeer costume and could not find it locally. The shipping cost was well worth the time it saved traveling all over to look for it. Dalamtion ears and a small Cruella cape! 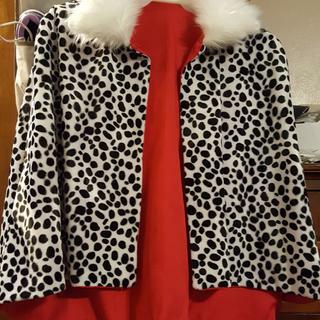 Making a Cruella Deville cape for my 5 year old granddaughter for Halloween! Using this print for a Halloween costume. to make a wrap for a cruella costume! I'm dressing like a dalmatian for a mardi gras parade! I was looking for a Dalmatian print on a fabric, but something more substantial than cotton so that my costume would not be seen through. This is the only Dalmatian faux fur I could find at an affordable price. I can't wait to get sewing Halloween costumes!. Could not find this item in the stores. The selection at the Online Fabric Store was great. The price was even better. Decent delivery time. My grandchild will be thrilled. Need to make a Cruella Devil jacket for my 7 year old for Halloween! Cruella DeVille Halloween costume. It's perfect! For a competitive dance costume for a "Cruella DeVille" dance. Need for a 101 costume. Working on a Cruella Devile costume. BEST ANSWER: Hand wash or gentle machine wash. Do not bleach or tumble dry and do not iron or dry clean. How many of you would recommend this for a cruella cape/coat. I see that's why most of you purchased. I am making one for my 6 year old and would like your thoughts. Can you recommend how many yards to purchase as well? For a cape or coat you probably won't need more than 2 yards. I love this fabric. It is light weight and will work good for a cape. I am making Cruella dance costumes for 14 - 5 year old. Are you making a long or short jacket? The material it wide you might only need a couple of yards. I'm making a long one but my 6 year old is the size of a 3 or 4 year old. I think that you would be fine with 2 yards, due to the length. I have a pattern here and it calls for 1 3/8 yds, but the jacket is not long. So 2 yds would be plenty. The fabric is 60" wide so you only need the length of your garment. It's lightweight and nice to work with. So 1 yard will be enough? I made an adult cape and it was more that enough. The cape looks great. Just 1 yard will be good? Does this have stretch to it? BEST ANSWER: Not really. Depending on what you are making you might be able to pull it. I used it to make ears and tails for kids puppy costumes and it was perfect. Would this be suitable to recover a chair seat? BEST ANSWER: This fabric is not meant for upholstery, but if it is mostly decorative it may work. Hello. I too am looking to make a Cruella Deville cape for my 4 yr old daughter but wanted it to be mid calf length. I also wanted the cape to have sleeves or an area where she could put her arms through and still have her shoulder and arms covered. I'm sure I can configure that. I'm just not sure how much fabric I would need? I'd also like too make a Halloween candy bag in the same fabric. Can you help? BEST ANSWER: Since this fabric is so wide, 2 yards should be enough for everything. Would this be good for making a blanket or throw? BEST ANSWER: Yes, it would. We recommend ordering a sample to be sure that it will work for your project. Could I use this to make wrap with out sewing it? or could I line with satin and use a fabric glue? BEST ANSWER: The fabric does not ravel, so yes, technically, you could make a wrap without sewing it. However, I think it would look much nicer if you finished the edges by turning them under and stitching a small hem. To answer your other question - lining the fabric with satin would be quite nice, but I would not use fabric glue. I think it would make the fabric too stiff. I do recommend the fabric. It has maintained it's soft feel after many washing. How long does a back order usually take? Could I get this to Michigan about a week before Halloween? How fast can I have this delivered to Michigan? Great fabric for my Cruella cape. I am putting together a Cruella DeVille costume and this was perfect for her stole. No problems with the purchase and it came in a timely manner. Love the way fabric feels, and look after washing. Recommend to my friends and families.